The ginger plant, particularly its root, or rhizome, is widely known for its uses in traditional and folk medicine. All around the world, this herb is consumed not only as a flavoring agent, but also ginger supplements are widely available to soothe an upset stomach, ease inflammation, and much more. While the health benefits of the root can be fully accessed by eating fresh, raw ginger, depending on the purpose of consumption, using dried ginger for cooking, drinking ginger tea, and taking ginger extract or syrup can also bring many beneficial ginger effects. Ginger water. Steep fresh, raw ginger in cold water for three hours or longer to make ginger water. For added nutritional value, ginger can be steeped with other fruits and vegetables. Ginger with food. 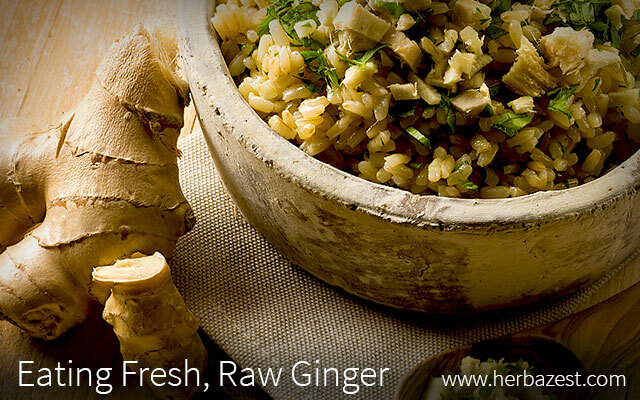 Raw ginger can be easily added to a number of dishes, especially Asian cuisine. For the full health benefits of this herb, try grating fresh ginger on a salad. Fresh ginger juice. Ginger can also be taken as a fresh juice. Ginger juice has been shown to reduce inflammation, migraines, and osteoarthritis pain. Ginger juice is also antibacterial, antiparasitic, and antifungal. The main medicinal compounds that give ginger its long-standing reputation as a natural healer are gingerols, shogaols, and zingerones. While raw ginger is rich in gingerols, when this herb is dried, it contains very high levels of shogaols, and when it is cooked, the gingerols transform into zingerones. While shogaols are known for having the most potent medicinal properties, the drying and storage processes decrease its nutritional content. For that reason, it is best to consume ginger in its raw form. Besides its content of gingerols, raw ginger is rich in vitamins and minerals, such as vitamin C, potassium, magnesium, and calcium, which are essential for maintaining normal body function. For example, potassium and vitamin C are important for repairing and maintaining tissues, while calcium is cardioprotective and helps build stronger bones and teeth. However, vitamin C is sensitive to environmental conditions and gets degraded when subjected to heat, prolonged storage, and light exposure. To make the most of ginger properties, it is best to consume this herb in its raw, fresh form. Often, there is much to be lost from cooking foods that are naturally good sources of nutrition.